The NNR considers public communications as an important component for effective regulation of the nuclear industry in South Africa. We recognize the public’s expectation to have access to reliable and easily understandable information about safety and regulatory issues in order to form opinions and make fully informed decisions. For that reason, consistent with its corporate value of openness and transparency, the NNR is committed to providing opportunities for public to participate meaningfully in the licensing process. Consequently, in the field of nuclear energy, science and technology, communication is an important prerequisite to ensure legitimacy of technical and societal decision making. 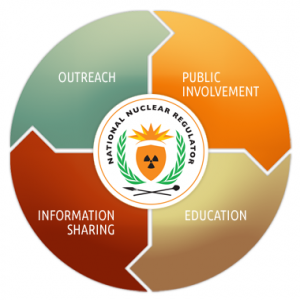 Therefore, the NNR’s combination of public education, information sharing and outreach is necessary for the achievement of sustainable and effective regulation of the nuclear industry. The NNR is committed to conducting its regulatory responsibilities in an open and transparent manner and keeping the public informed of its oversight activities. We recognize the public’s interest in the fair regulation of nuclear activities and therefore provide opportunities for concerned citizens to be heard. The NNR considers public hearings a valued and important part of the licensing process and encourages the public’s participation and involvement. More information on Public Hearings can be found under the Authorisations section.